The number of new homes started in the third quarter of the year was down 54% compared to the same time last year, according to the latest figures from Spain’s College of Architects. Excluding social housing, there were just 17,500 planning approvals in the third quarter, compared to 28,400 last year. 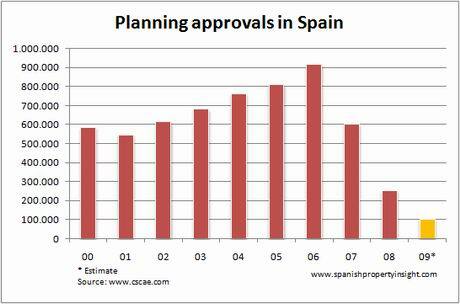 To put this into perspective, planning approvals were down by 94% from 287,000 in the third quarter of 2006, when Spain’s construction boom was in full swing. The chart above shows quite how savagely Spain’s residential construction pipeline has collapsed in the last few years. This year we are on target for a total of just over 100,000 planning approvals, the lowest level in more than 20 years. It’s hard to imagine now, but thanks to this collapse in the pipeline, one day Spain may have an acute shortage of newly built homes. Total planning approvals (free market and social housing) were down 48% between July and September, with the biggest falls in Murcia (-80%), Cantabria (-76%), The Valencian Community (-72%), Galicia (-66%), and Extremadura (-62%). These kind of dramatic slumps in construction activity will be hammering jobs in areas like Murcia, which were some of the biggest beneficiaries (or victims) of Spain’s residential construction boom. Planning approvals for social housing were also down, despite much government talk about boosting housing construction via this route. There were just 7,448 planning approvals in the third quarter, down 26% on last year. In The Valencian Community they were down by 72%, outdone only by Galicia (-86%) and Murcia (-73%). In reality, fewer new social housing projects are no bad thing for the market, though of course it does mean higher unemployment in the construction sector. There is no shortage of empty homes in Spain so there is no need to build more social housing. What Spain needs is more affordable housing, which means reducing the price of property already built but not sold. It has also emerged that, despite massive demand for social housing, there are 4,000 empty council flats in Catalonia, thanks to gross incompetence by the regional government. It’s bound to be a similar story in other regions.